This topic provides a description of the controls on the Select Streams dialog. To select video and audio streams of the opened multimedia file to view and extract frames click Streams... menu item from the View menu. This option is available only for video frames. By default, video and audio streams are loaded automatically opening the multimedia file but there are occasions where you need to take over control and change the active video and audio streams. This could happen when your source clip contains more than one single video and audio stream. You can select the desired video and audio streams of the selected multimedia file by choosing them from the combo boxes according to stream indexes, ids, codecs and other properties. 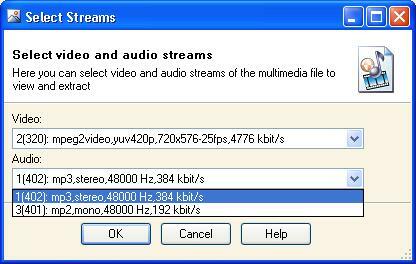 Press OK button to load the selected video and audio streams and close dialog.